Finally time for a non-Brooks shoe review. I love the Wave Universe series so much. I really do. And I will start it off by saying that the Universe 5 is my favorite racing shoe of all time (thus far). On deck we have the Mizuno Wave Universe 5. 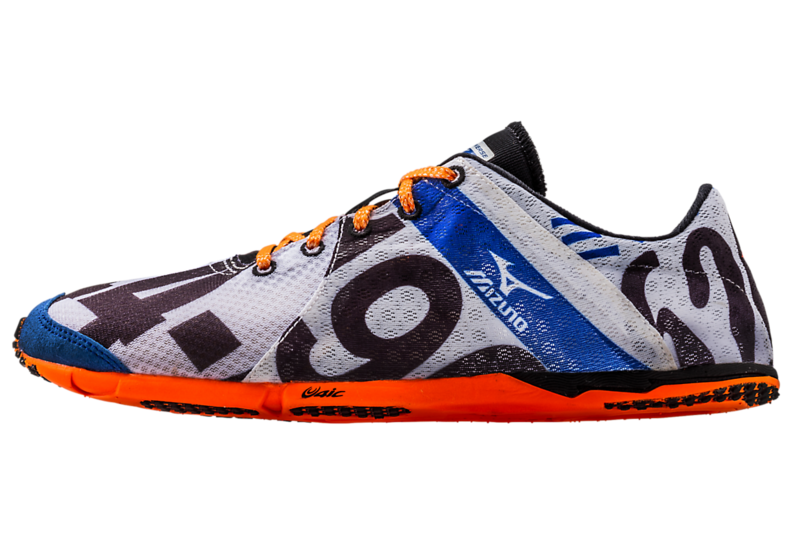 This is Mizuno's 5k/10k racing flat that comes in at an amazing 2.8 ounces. 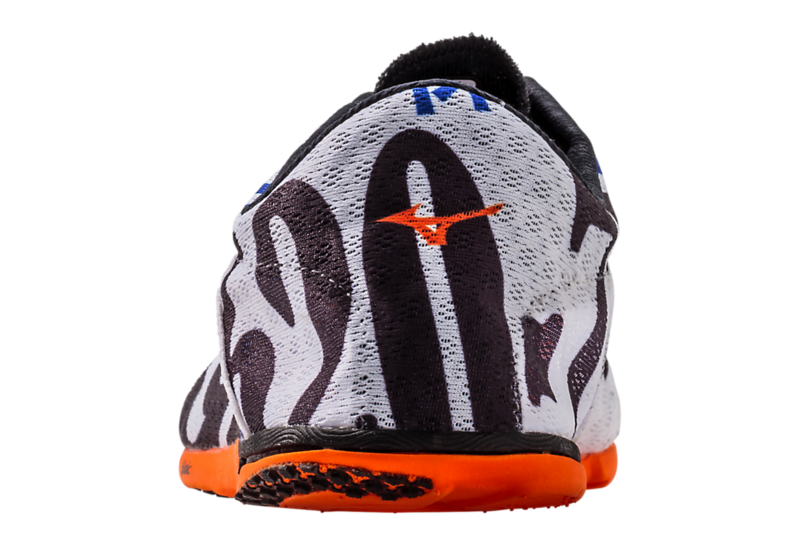 This shoe has a 2mm drop according to Running Warehouse (feels flat to me) and a none-removable insole. As of now the Wave Universe series has retaken the "lightest racing flat" award back from the New Balance RC5000. The series is named as such because they are supposed to be the "Lightest Racing Shoes in the Universe" (obviously ignoring any alien races who also happen to run that have created an even lighter shoe that we are not aware of). I have a great deal of history with this series. I have worn the Wave Universe 3, 4 and 5 and have loved each one. The Wave Universe 3 and Saucony Type A4 were my introductions to minimalist running as I trained in both of them for some time (and loved both of them). I have raced in all three Universes extensively and have done many workouts in the 3s and 4s. The 5s I have saved for racing due to a couple reasons I will get into. So yeah. A 2.8 racing flat. It feels like there is nothing on your feet. Almost. The sole is surprisingly cushioned ("cushioned" being an extremely relative term) for how little there is there. And they are responsive. REALLY responsive. The first time I raced in these I set my 5k road PR in 14:45. That was of course a week before I my peak race at the BAC 5k last summer, which I kinda bombed because I went out too hard with the Kenyans and Ethiopians. That and I hadn't fully recovered from my PR race (also I'm an idiot, got excited and did too many hard workouts during my peak week). See how flat that heel drop is?? These shoes feel really good. They disappear off your feet and you totally forget about everything down there except how much pop you're getting flying down the road (or track if that's what you're into). And they feel at or close to zero drop in terms of the heel-toe drop. So be prepared that if you are not used to running in very low drop shoes, these will wreck your calves. The Wave Universe 3 and 4 had some drop (4-6mm) to give you some (not much) achilles protection. These have next to none. It's like running in a track spike. 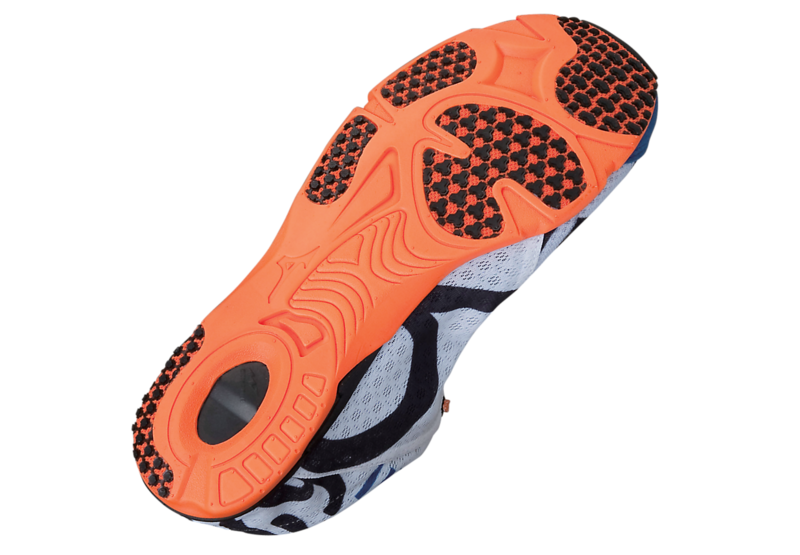 The U4ic midsole is very responsive and this is the closest thing I've felt to a track spike for the road. And the upper? A minimalist's dream. The toebox is non-constricting, fairly wide for a racing shoe (like all the Wave Universes) and the upper is barely there. In racing conditions I was very nervous about this, but found that when I tied the laces down tight, I had very little to worry about. Would I like a little more structured upper? Yes. I like the midfoot to have some lock down. But I cannot complain as there is no heel counter and thus nothing to irritate my calcaneus. Also it's 2.8 ounces. I don't think they have much more to take out before the shoe falls apart after one race. So yeah. I'll shut up about that. On a side note, I have not raced sockless in these yet, but wearing them around the house without socks has caused no ill effects. I'll go hammer out another race soon in the Universe 5 as my achilles is getting used to being in low drop shoes again. I'll see where I'm at next Saturday and report back with the sockless details. Mizuno did put some strategically placed material (called G3 Sole) to give some traction and bite the road (see the picture above). Which it totally does. I have never had to worry about traction in these as they grip the road very well. The Wave Universe 3 and 4 had decent traction, but this new sole is awesome for the most part. I do have one problem. And that problem? Outsole durability. Yeah..... It's not good. I have 5 races in them with about 20 miles total and the wear is significant. Yes I get it. The shoe weighs 2.8 ounces and there is barely anything there. But for $125 I would hope for some kind of durability. Which I guess is in the upper. I'm surprised that with how little upper there is that it has absolutely no rips, tears or any signs of wear compared to the sole. They seem to be going strong so far despite the outsole wear. I guess you're paying for the light weight and super responsiveness. So that's why I keep them for race day only. But that's really the only problem I have with them and I'm pretty hard on shoes. So that is the Mizuno Wave Universe 5. This is my all time favorite racing shoe. Not the best durability, but it is a FAST shoe. I still cannot believe how much relative protection it has for how little shoe is there. If nothing else, go try them on. 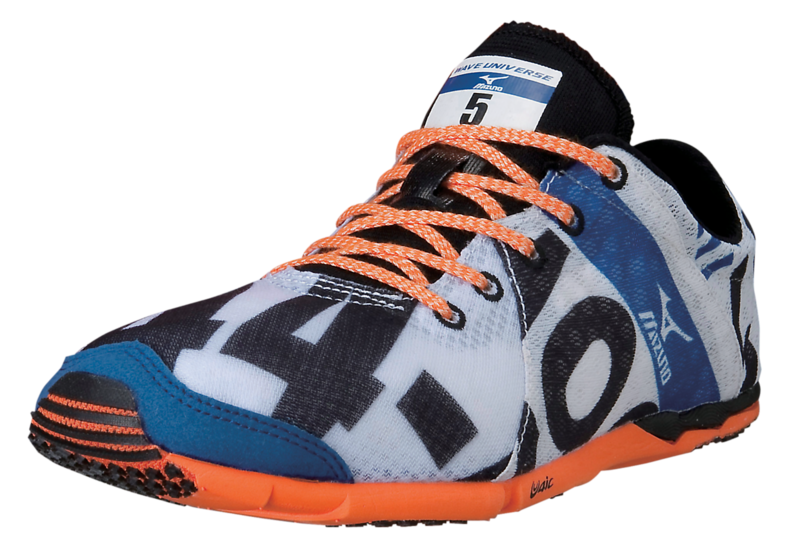 This shoe is for anyone who wants to run insanely fast over the 5k (maybe 10k). I would not try them over 10k unless you are a seasoned minimalist runner. If you are a minimalist runner, you will especially like this shoe. I started racing in them when I was training in the 6oz Brooks Puredrift. At 2.8 ounces, there are only a handful of shoes that you could train in where you wouldn't notice the weight step down on race day. Give them a shot and go fly down the road. As always, my opinions are my own*. *Shoes were provided free of charge from the Foot Traffic Mizuno Rep Ben Evans. Because I was bothering him for a free pair. Thank you Ben! *Images obtained from the Mizuno Running website. Go down to your local retailer to check them out!